(NaturalHealth365) Living in an ‘advanced’ (modern) society, it’s easy to take for granted our ability to access running water. For example, with a simple turn of a spigot, we can get all the tap water we want. And, while most people think that treated city water is clean and ‘safe,’ the Flint, Michigan water crisis got us all to thnk differently about our water supply. The truth is: the potential danger of bad water is more widespread than most people ever realized. In fact, there’s a significant chance you’re drinking tap water that’s contaminated with radioactive chemicals – a frightening revelation officials tried to cover up. According to a 2010-2015 analysis performed by the Environmental Working Group (EWG), as many as 170 MILLION Americans were exposed to drinking water with radioactive contamination high enough to increase cancer risk. The levels of these radioactive compounds – including cancer-causing uranium, radon, and radium – exceeded the legal limit set by the federal government and Environmental Protection Agency (a limit which many believe to be outdated, anyway). Want to see what kind of tap water is pumping through your faucets? Be sure to check out this incredibly handy interactive map from EWG. It breaks down radium contamination in water around the country and can give you a high level of detail about what’s in YOUR drinking water. We know already radioactive contamination increases a person’s risk for cancer. But it also can damage your health in many other ways. Sadly, the effects of radioactive material exposure is even worse for children and developing fetuses. Fortunately, the EWG does offer several solutions for protecting yourself and your family from the potential consequences of radioactive water. First, buy a high quality water filter. Depending on where you live, you can also buy detection and mitigation kits for radon in your home. Keep in mind, ccertain areas have greater radon levels in soil and rock. Quit smoking (or don’t start), opt for chemical-free household cleaners, eat organic and ethically-raised food and avoid processed ‘junk foods’ loaded with unnatural sugars, trans (toxic) fats, and unwanted (synthetic) additives. Editor’s note: Personally, I avoid this entire issue by ONLY drinking Tourmaline Spring water. 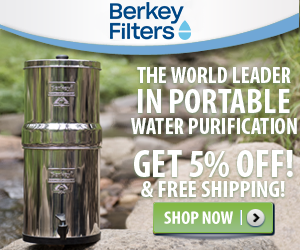 But, if that’s not an option for you, check out my podcast about the Berkey Water Purification System.